No matter how much bands try to avoid being part of a current "scene", for most it is inevitability. Today's musical sound of that sultry, punky New York feel has produced some great bands, but it is often more than refreshing to discover a young, new group of people delivering something all of their own. Ladies and gentlemen, I give you The Sleepy Jackson. Heralding from Perth in Australia, this trio has already caused quite a stir down under and are preparing for a similar assault on these European shores over the next few months. Likened to some of music's most innovative groups, such as Mercury Rev, dEUS and The Flaming Lips, they have just released a mini-album entitled "Let your love be love" and are putting the finishing touches on their first full-length album. Speaking to singer/songwriter Luke Steele in Australia as he put down some vocals for the new album, he exudes an optimism and excitement of an endearing, almost childish quality. Looking forward to their first headline tour of Europe in the near future, Luke commented: "Yeah, we seem to have been received pretty well in Europe. People respect us a lot more in terms of the melodic sound of the band than in Australia. They are not as educated musically in Australia, so we've found a lot more respect in Europe". 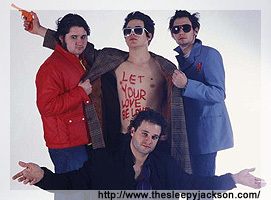 The current mini-album circulating on these shores is a collection of material taken from two previous EPs, but Luke is adamant that this is not an entirely fair representation of The Sleepy Jackson's overall sound. "International producers picked the songs, which is a bit unfortunate as we are quite diverse, but at least people get to have a listen. But we do have another side, like our drummer [Malcolm Clark] sometimes writes these really beautiful melodic piano pieces." As the new album is being completed, Luke also conveyed a notable change in its sound. "There will be a definite change on the new album. The mini-album was an introduction. On this there will be some of those sorta genre songs, but maybe with stuff like Joy Division." Commenting on the, as yet unreleased, material, Luke spoke of a song titled 'Morning bird' on which they have an eight-year-old girl as a guest vocalist singing "Don't cry my morning bird, the Lord is sitting in the sky waiting". Luke sees the intensity of such melancholic vocals sung so innocently as a very beautiful piece of his music. Just one listen to the Sleepy Jackson's EP and it is evident that these guys have a detailed and methodical approach to their music. Every sound and every note is something different, but yet it fits so well. "Our music has a lot of different layers," offers Luke. "We are into seeing how high one melody can be taken, more up than across the water". After two more weeks in the studio, Luke and his sleepy boys will be heading off on a 25-date tour with Silverchair, with a possibility of summer festivals on European shores. However, The Sleepy Jackson are playing a gig in little ole Dublin in May. If Luke manages to convey on stage just a fraction of the passion I received down a telephone line, then the music scene is in for quite a nice surprise. Believe me, this is not one show you should sleep on. The Sleepy Jackson play Whelans in Dublin on the 12th May.